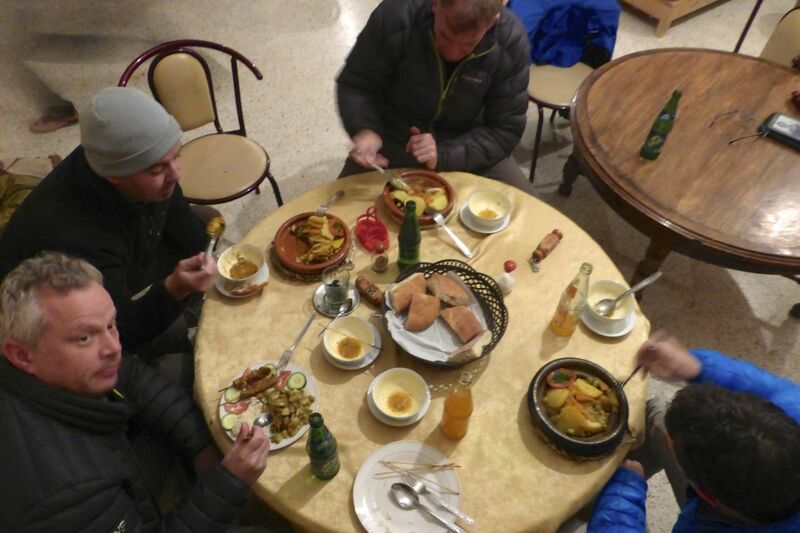 All food (including bottled water), fuel and accommodation in Morocco for six or seven days, plus guiding and support for whatever problems may occur. So what will the tour cost me in total? 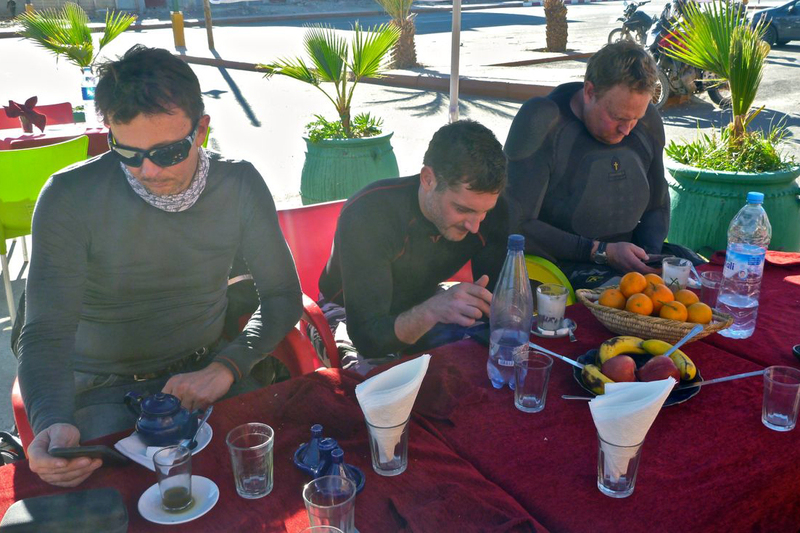 The tour price plus flight (Easyjet from £120 return), bike rental (G310GS from 3600dh) and travel insurance (from £26). So call that from £1150 for the shorter 6-day spring tour. No, just me on a bike. I’ve considered a 4×4 backup but it complicates keeping together, plus hiring in a driver would all increase the tour cost. 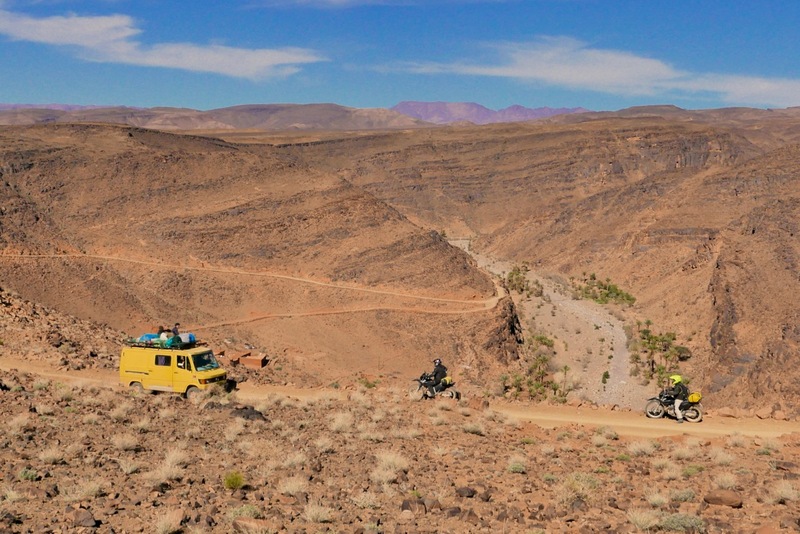 For more remote off-road tours I’ve used 4×4, but the relaxed pace of our Moroccan tour has yet to end with serious breakdowns or injuries. One day it may happen in which case the itinerary may have to change and, if needed, a replacement bike gets delivered overnight. Yes. And it needs to cover you for renting a motorcycle in Morocco. If you have trouble finding such insurance I can give you some suggestions. It costs from £26. People mistakenly regard all ‘Arabic’ or Muslim countries as one place, but Morocco is a long way from Saudi, Iran or even Libya. Factor in the huge volume of tourism and Morocco is exceedingly safe. And by avoiding the popular tourist spots, for us it’s even less hassle. 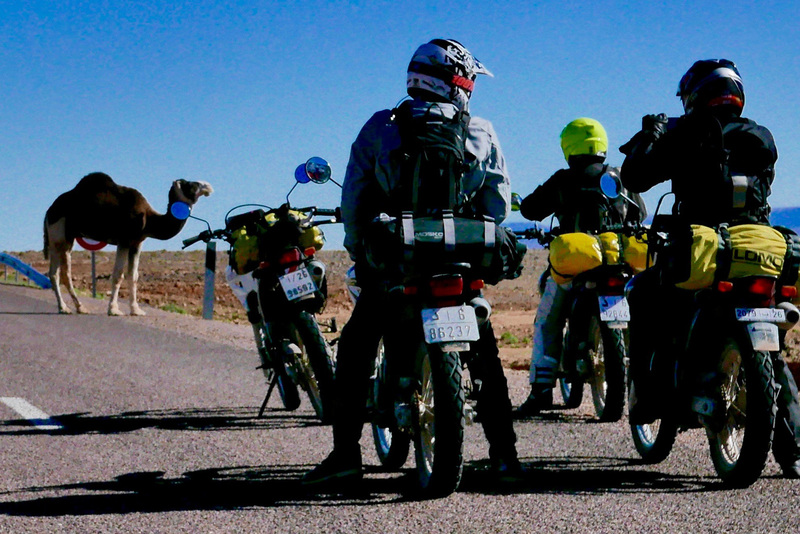 It is if you have several years experience in riding motorcycles, including riding abroad; you’re not looking for an off-roading challenge; you are fit enough to ride five or six days, and you’re interested in more than just bombing around on motorbikes and a beer every night. Before you book have a sit or even a test ride on a GS310 to see if it’s the bike for you. Yes: you must have at least five years motorcycle riding experience and be under 65 years old. What sort of motorcycles are available? The Marrakech agency I work with rent several machines, from scooters up to the 1200GS and the tracks we follow have probably been done on all those bikes, as well as locals on mopeds and minivans. 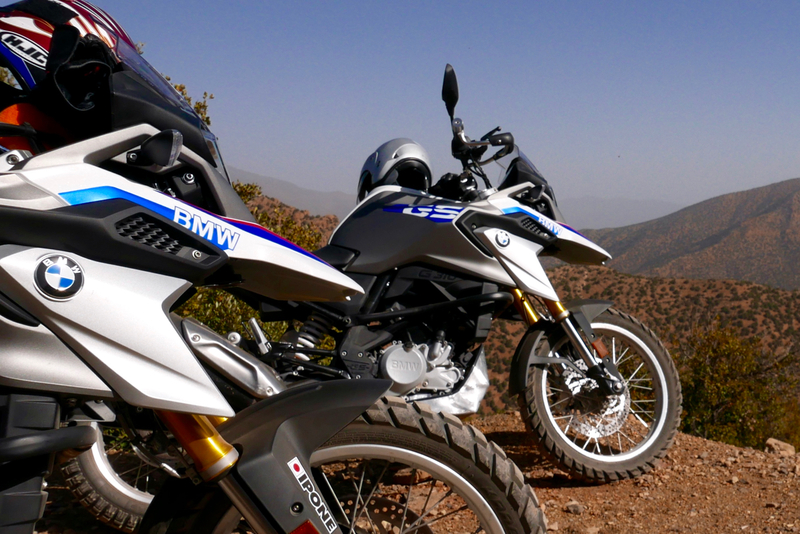 The BMW G310GS (above) is ideal for these tours. They have been adapted for off-roading, have low or lowered seats and were new in 2018. 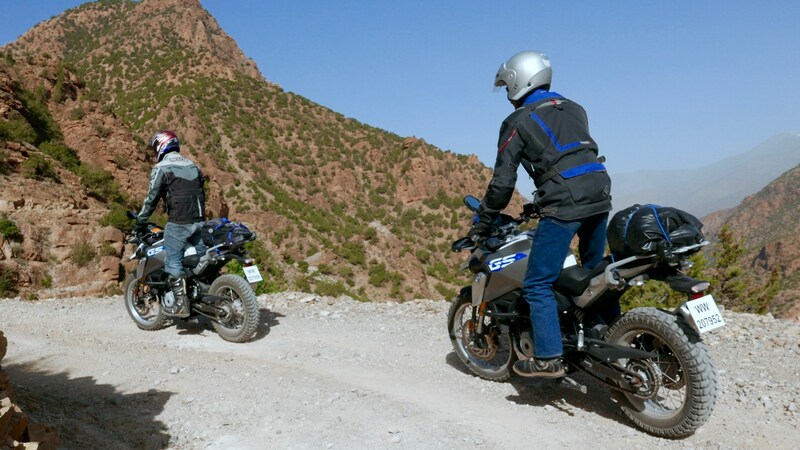 But if you think you may like a bigger motor and can handle the weight, I can recommend a G650GS or the F700GS twin, especially the one with the lowered seat. How do I organise the bike rental? I reserve six 310s for the dates given. If you want a bigger machine, let me know soon – there are fewer available. These bikes are insured for road riding, but not for any damage that may occur. 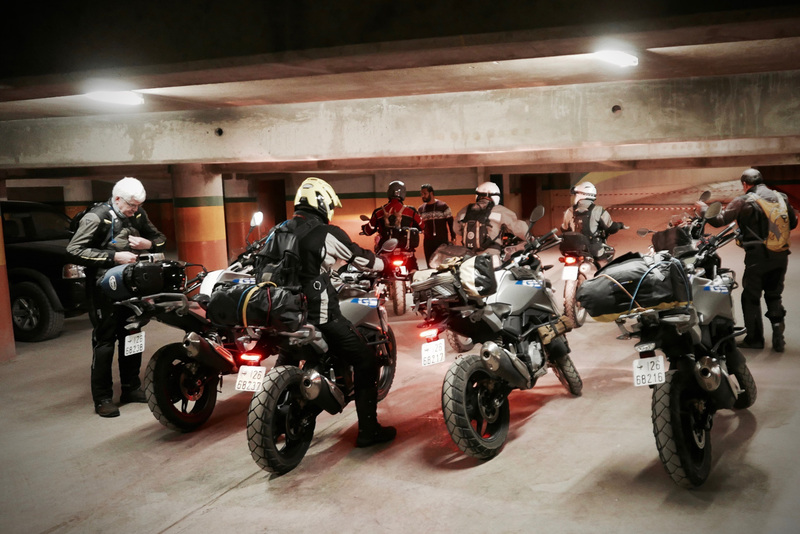 You pay for the bike on day two with a credit card and also submit a credit card deposit for 12,000dh. This gets cancelled in front of you when the bike is returned in good shape. What sort of tyres and other equipment do these bikes have? The tyres are mostly what came out of the crate or all-road (trail), like Mitas E-07 (above). As long as it stays dry (rain is rare) and you ride appropriately, they’re fine for what we do because the 310s don’t have to power to break away. Some of the bigger bikes may have what I call ‘road tyres’ (Anakee, Tourance, etc). All bikes have engine- and handlebar guards, tail racks and some have bar risers. And now they are all tubeless which greatly eases puncture repairs. What happens if I scratch or damage a bike? Most falls are at at walking speeds which might scratch the plastics and crash bars but ought not cause any chargeable damage. However, the agency is now a little more strict about scratches and dents on their newish 310sthan they were on the beaten up Tornados or other older machines. In 2018 two riders ended up paying 500 and 300dh (£40 and £25) for damage. One 310 rider fell over several times, scratching bars, plastics and breaking a mirror; the other struggled with a rental 1200GS. Is the tour suitable for pillions? No. The added weight would make the bikes unmanageable and exhausting to ride on the piste. Getting clear of Marrakech (and getting back in) is the biggest stress, so keep close or get left behind! (I always stop at junctions for the group to catch up). After that we’re on backroads, including exposed switchback mountain roads and tracks where you must anticipate what may be round the next blind corner: loose gravel; mud; a stream; landslides; a taxi overtaking a bus, zombie goats on roller-skates – it’s all happened! The stony pistes can get briefly gnarly, but we rest often and it’s just couple of hours at a time. If that sounds lame, you may not think so by the end of the week. Some days there may little off-roading, but even normal backroads are washed-out, potholed, strewn with gravel and are constantly being repaired after flash floods. You need to ride alert. What are local driving standards like? I find the south much quieter than the north of Morocco; traffic is light and drivers less aggressive. Nevertheless this is Africa so you must be ready for unpredictable manoeuvres, wandering pedestrians and animals, contrary signalling and potholed and gravel-strewn roads. The best thing to do is ride at a speed that’s complementary with the local traffic, you and your bike’s abilities, road conditions and an understanding of the scant availability of medical support. When overtaking on mountain roads, be sure you have sufficient speed, power, space and visibility to do so safely. Do I need to be experienced off-road? Not really, but several years of road biking will stand you in good stead – you need to know how to handle a bike competently on the road. Off-road, mountain bikers as well as skiers and surfers are quick to recognise the fluid balance, weight adjustment and forward anticipation required. 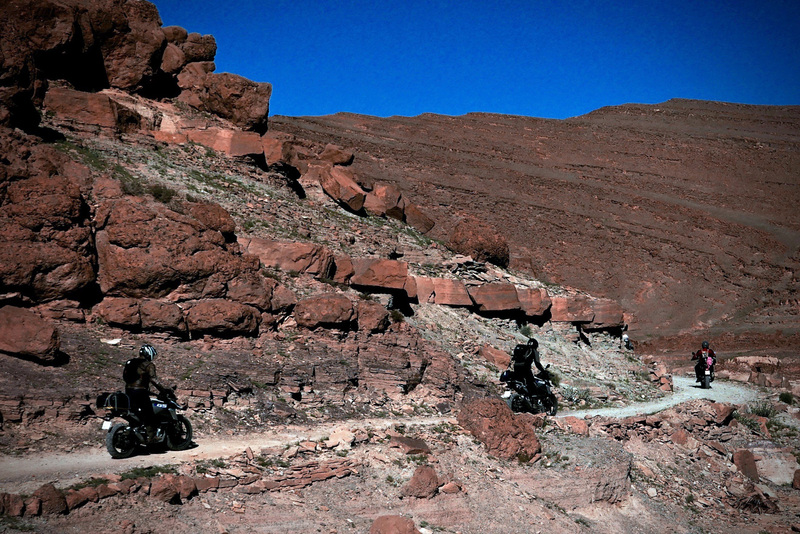 All previous tours have included riders with no or negligible off-roading experience or who’ve barely ridden in years. 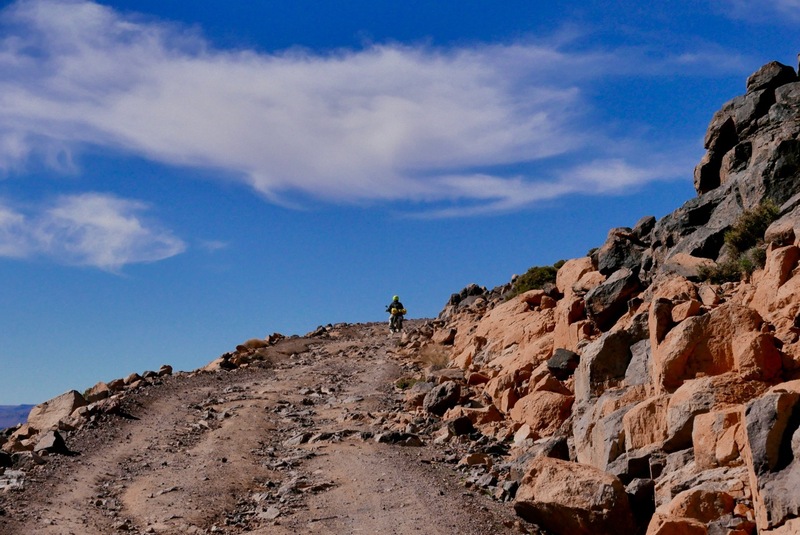 Some ride more slowly and cautiously than others, but they all managed fine because the trails, the pace and the bikes make it all achievable. But you do need a bike license and at least 5 years and 20,000 miles of riding experience – primarily to be confident in traffic and on exposed mountains roads and tracks. 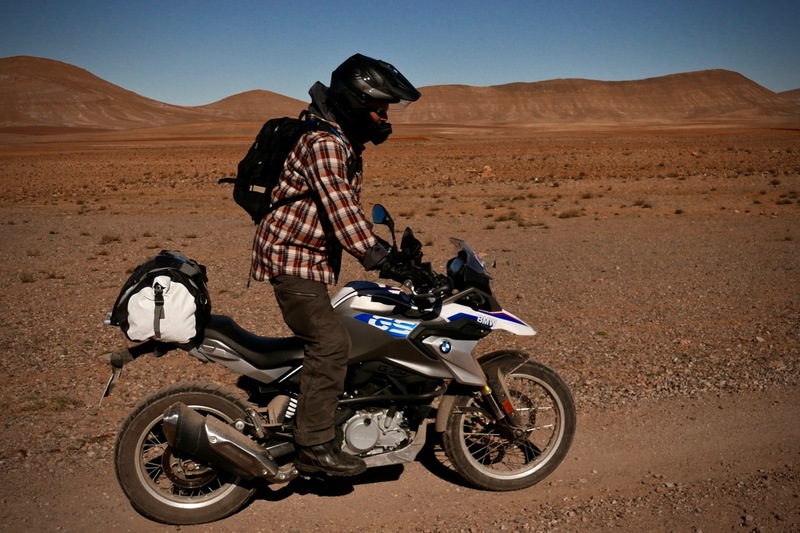 It will also stand you in good stead if you’ve done your own multi-day trips abroad on a bike, so you’re familiar with what- and how little you need to pack. Some new-to-dirt riders also like to take weekend, off-road training courses back home before the tour. In the UK these are usually on very light or huge bikes in muddy conditions. Riding wise that’s more technical than Morocco and I’m not certain they add much actual value for what they cost. Whether you do or not, by the end of your tour you ought to be much more confident about handling a motorcycle on loose surfaces. Do we ride every day? From the morning we pick up the bikes, yes – so that’s five or six days. We’ll get up, eat breakfast, gear up, check water and ride off around 9.30am, stopping here or there for coffee, photos, fuel, repairs or rests. We pull in for a light lunch somewhere, then carry on as before, ideally getting to our lodgings with daylight to spare. We will then repose or otherwise occupy ourselves until the evening meal, after which we are again free to do as we wish. Note that the schedule can go to pieces for any number of reasons (usually punctures/breakdowns or bad weather or unusually slow groups), requiring longer days, short cuts, quick-stop lunches in roadside cafes, or unscheduled stopovers. November in Marrakech can be hot and sweaty or rainy, but once over the Atlas the desert climate and greater elevation means days are usually sunny and warm. This was what we got in 2015, 2016 and 2017 – barely a cloud for seven days. But in November 2014 one group spent three days flood-bound in a hotel, and one tour in November 2018 became much chillier than normal (but was still above freezing in the mornings). Spring 2018 was pleasantly warm to hot, and after winter it was nice to see greenery returning to the landscape. But there is more of a chance of rain showers at this time. For all tours it best to be ready for rain. Will we ride in sand dunes? No. And there’s little more than a few metres of loose sand on these tours. Until you’ve tried it, dune bashing looks like fun on the right machine, but in my experience – car or bike – all the biggest accidents occur in dunes. Morocco has only two dune areas and we pass far from them. I’m not from the UK, or even the EU, is that a problem? No, as long as you hold a full motorcycle licence and fit the other criteria. But for insurance reasons it’s no longer possible to accept riders from North America. 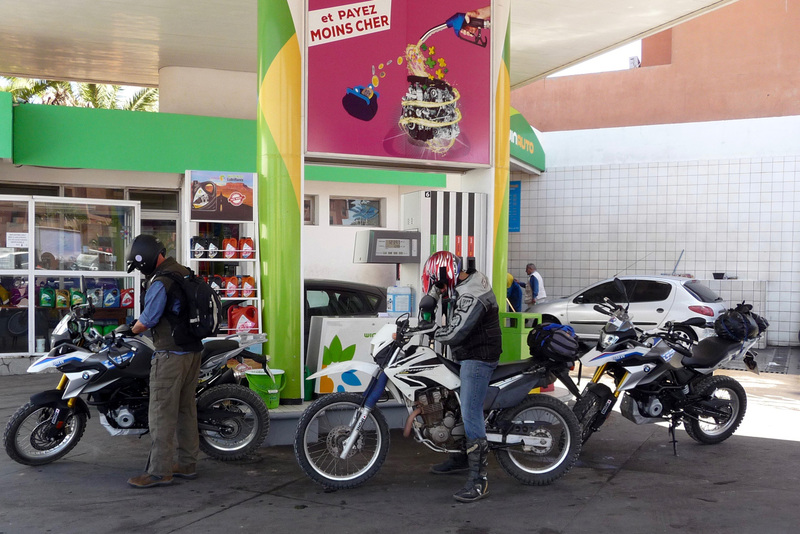 You must bring basic riding gear: helmet, gloves, boots, as well as a light daypack, ideally with a water bladder (CamelBak, etc) for the warmer dates. The bladder means you’re able to drink easily on the move. This is important if it’s on the warm side. 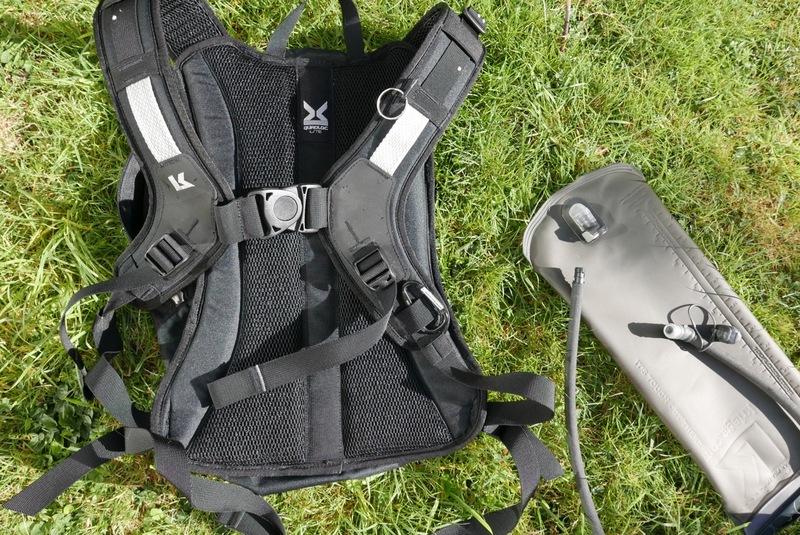 Once you’re signed up, our friends at Kriega offer discounts on their gear, including something like the R15 pack and hydrator (right). Your main baggage goes on the back of the bike. By far the best way of quickly securing your bag to the bike is with a pair of inch-wide ROK straps. You can leave other stuff at the rental agency’s secure agency lock-up or at the Marrakech hotel. You don’t need bike tools, puncture repair kits, compressors and so on; I carry all these. A fuller list of gear is supplied as the tour fills up. Some young riders have turned up in jeans, a ‘fashion’ leather jacket, hiking boots and a full face helmet. Others rock up in full MX armour, MX boots, MX lids and MX goggles over a brightly-colour MX jersey. Wear whatever you feel comfortable in and are happy to crash in. The important things are foot-and-ankle protection without resorting to full-on MX boots, a functional jacket with vents and pockets, thin, comfy gloves and a helmet with good visibility. That’s what I wear. Elbow, shoulder and knee armour may feel reassuring, but won’t stop broken bones or bruised limbs. 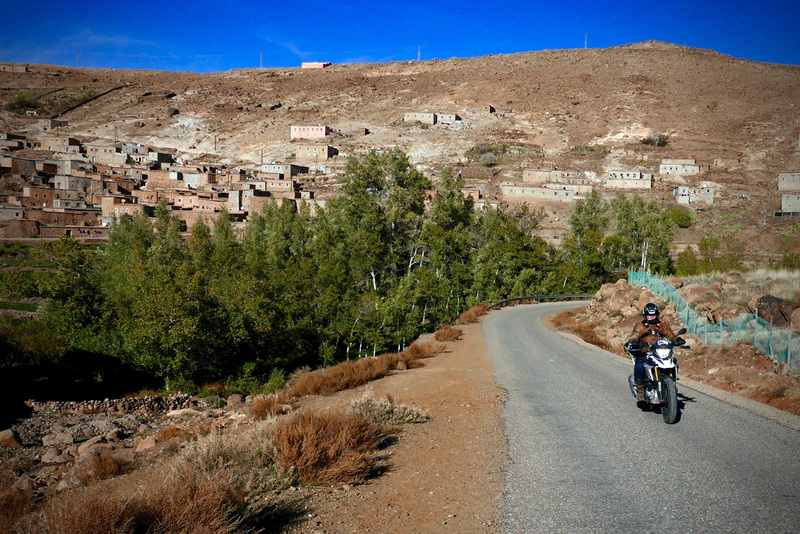 High Atlas mornings may be chilly, desert afternoons may get warm. Rain will be wet. 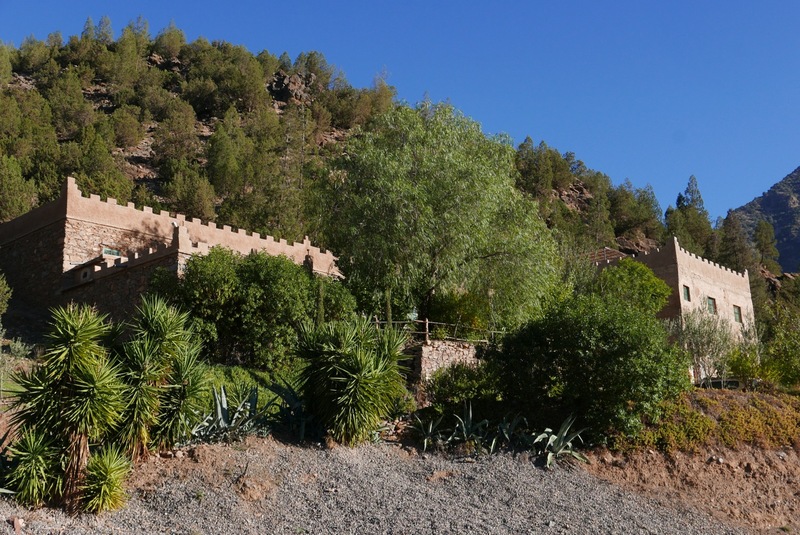 Over the last couple of years I’ve gradually raised the quality of accommodation to a mixture of cosy mountain lodges, ambient desert homestays and lavish kasbah-hotels. The Marrakech rendezvous hotel is a regular tourist joint. Almost all have en-suite rooms which are shared by two or occasionally three people, if space is tight. The hot water may be sketchy, the plumbing may be ropey, the towels unfluffy or slow to arrive and there may be no soap. Bring soap. 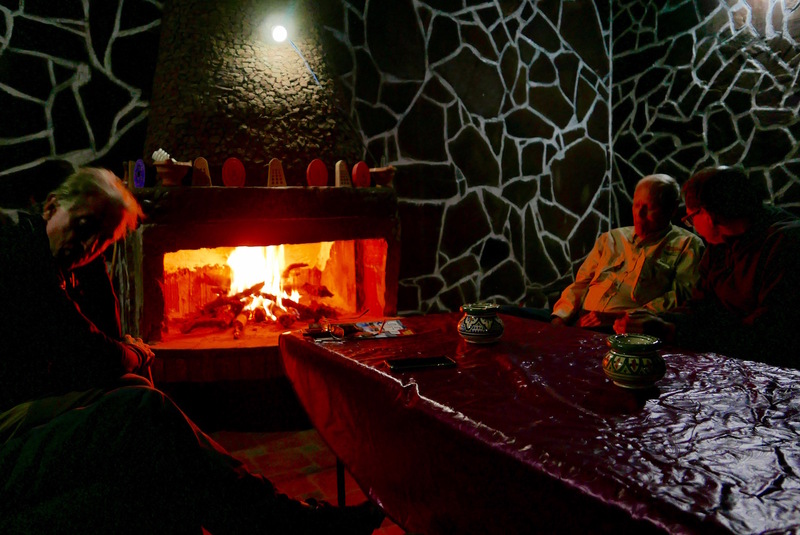 This is southern Morocco, not Palm Springs or even a luxurious Marrakech riad. South of the Atlas Morocco is much more ‘African’, which works both ways. It feels wilder but is also much poorer and less well served by amenities you may consider commonplace. If you’re not prepared for some discomfort or inconvenience, this tour may not meet your expectations. If you prefer your own room if available (almost always, as long as everyone doesn’t want one) it costs an additional £120. Tap water is fine. That’s what I drink, but most take the bottled water I supply free. It can vary from lavish to basic, but is always wholesome and freshly prepared. Breakfast is tea and coffee with bread and pancakes with sweet spreads and they may do an omelette. Lunch tends to be light, otherwise we wait for ages. It can be freshly grilled sardines or brochettes, salad and chips – or in some one-horse desert towns just an omelette with bread and tea. It’s all they serve. 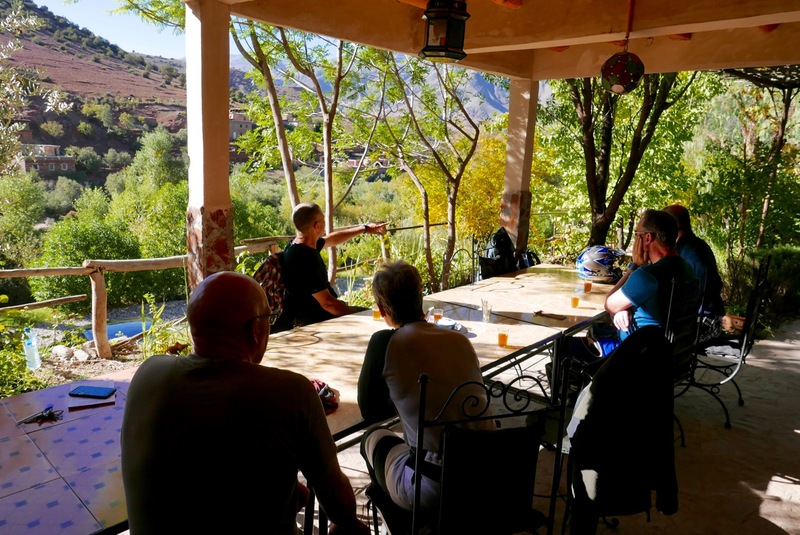 When we get to our lodgings they lay on more tea with nibbles on the terrace and dinner is usually a tajine (stew) with a soup or salad, plus fruit for afters and more tea or coffee. There should be no need to bring supplementary snacks from home. I occasionally buy biscuits, fruit and nuts and cheese triangles for the group from village stores. I am a vegetarian or have other dietary requirements. Is that problem? No. Lunch is often meat-free and vegetable tajines can be as tasty as the meat ones and the places we stay are used to preparing them. If you’re gluten intolerant you need to take special care to avoid getting ill. There is a lot of bread on this tour. Am I likely to get the runs? No. Morocco is not like Egypt or India in this regard. In my experience stomach upsets can occur in more touristy restaurants where food isn’t prepared freshly or is re-used. We don’t visit these places where possible and even then, it’s not usually bad enough to affect your riding for more than a day, so just keep drinking, keep riding, keep taking the blockers and keep a toilet roll handy. I carry pharmaceutical rehydration sachets as well as Imodium-like ‘blockers’ which are also easily bought from local pharmacies. 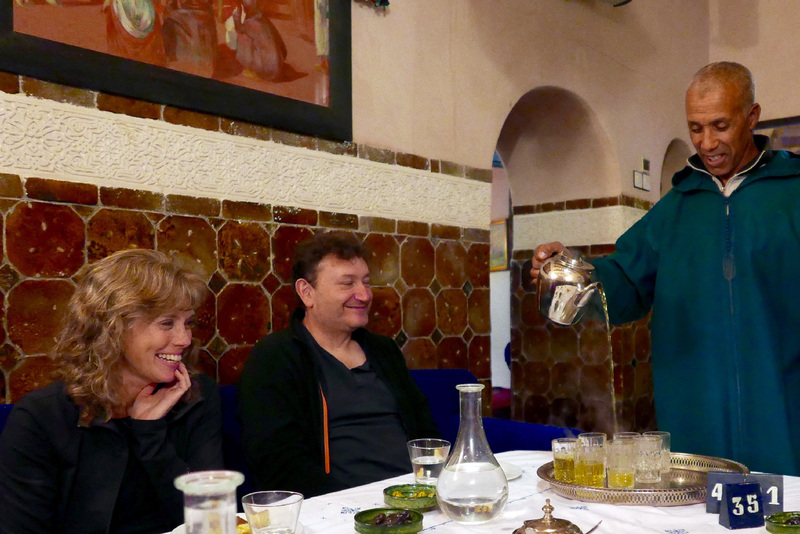 Once out of Marrakech, it’s not available at most of the lodgings so it’s best not to count on getting any. What happens if I damage my bike or it packs up? If your bike dies on you or gets smashed up, the rental agency will come out with a replacement. You may have to pay for the damage. Or if I hurt myself or otherwise can’t ride? Arrangements will be made for the recovery of you and your bike, as well as hospitalisation if necessary. This is where your travel insurance is essential. The pace and nature of these tours is such that this has not happened yet and hopefully never will. What happens to our tour in the event of such a delay? It’s happened elsewhere and the entire group became involved in the recovery and accepted it as part of the experience. Can I leave the tour at any time? 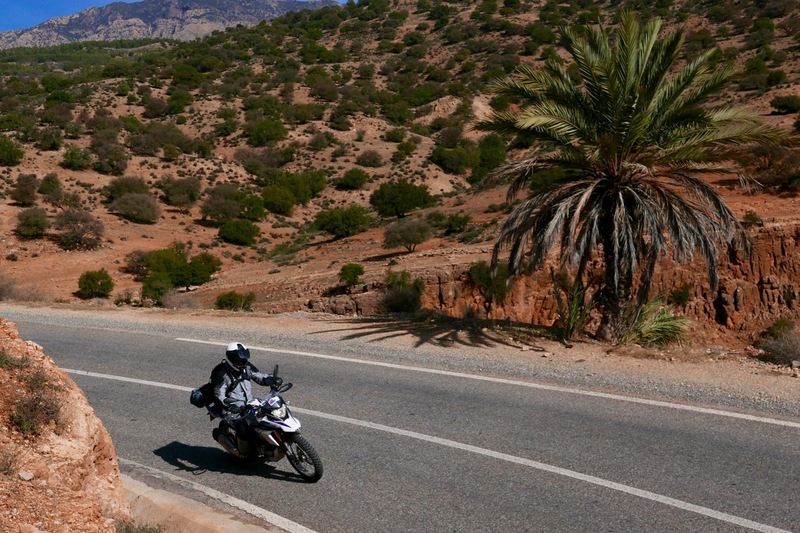 An ill-prepared rider left early once, but you’re on your own and it will be your responsibility to return the bike to Marrakech when your rental period is up. There are no refunds if you leave the tour early. In more places than you think. You can buy a local SIM card for as little as 20dh which includes 20dh of credit, as well as data SIM cards to use the local 4G network. Some inadvertently leave their smartphones on ‘data’ and got notified of a £100 bill before even leaving Marrakech. Sort your settings out. Is there lightning-fast wi-fi at the lodgings? It has got a lot better in the recent year or so. In most places we stay or stop at there is some sort of wi-fi, but south of the Atlas it can be hit and miss or slow, especially if we all try and use it at once. Some mobiles seem to hook up better than laptops and tablets. 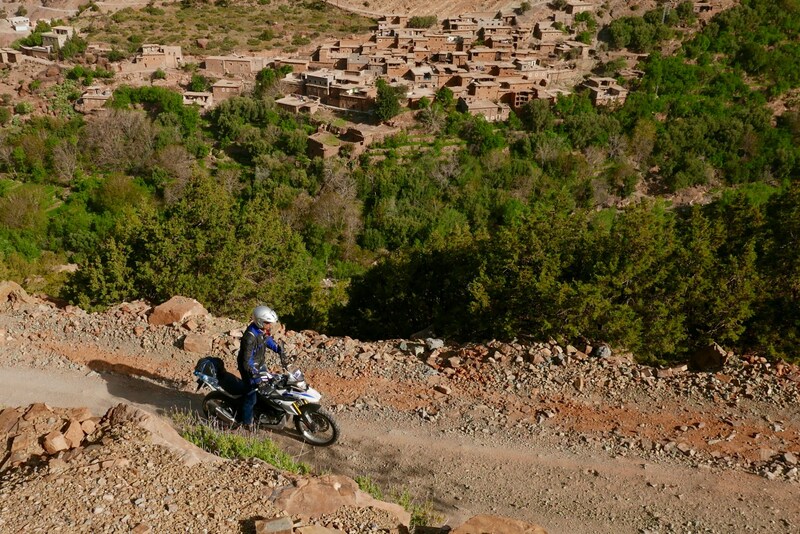 What routes from your Morocco Overland guidebook do we follow? I tend to mix it up in the MH, MA and MS regions. 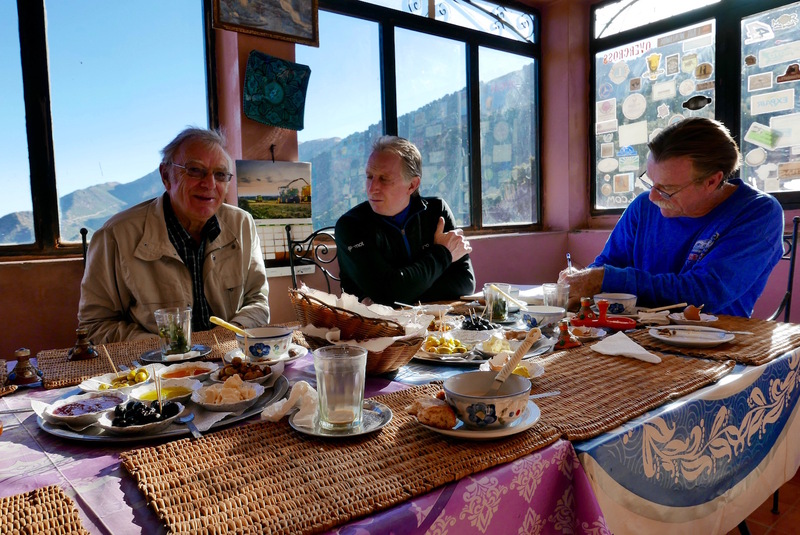 I don’t have fixed itineraries, plus I like to make it up as each tour develops, depending on the ability and preferences of the group, as well as the weather. 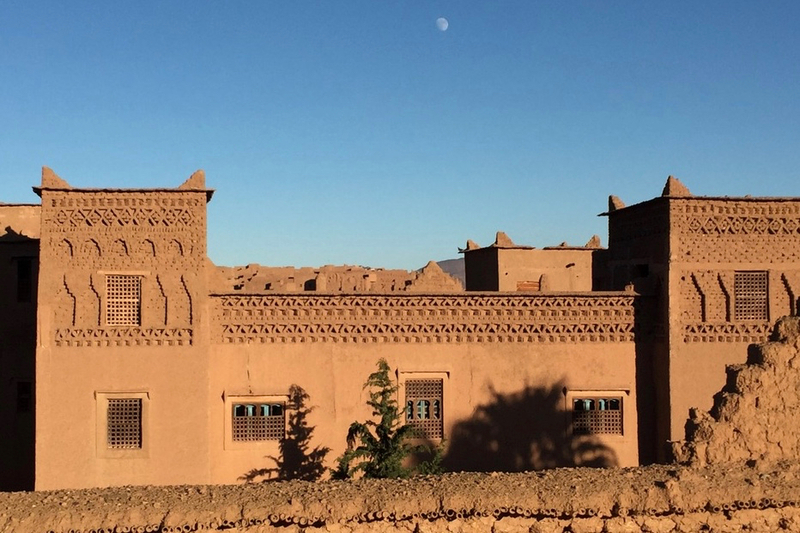 On the autumn tour we head south out of Marrakech follow a 1100-km anti-clockwise loop and return over the Atlas from Ouarzazate six days later. On the shorter tour we cover less distance and come back the same way but via another route. Is it worth me buying your Morocco book? 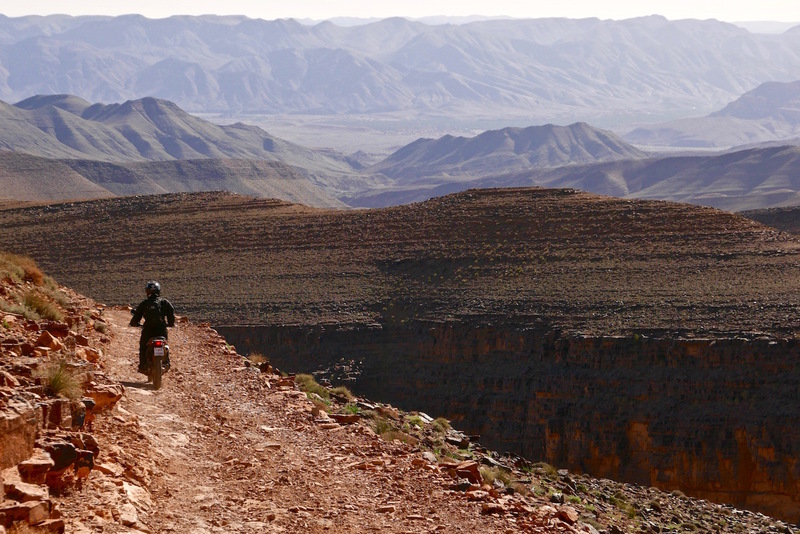 It’s not necessary as you’ll be doing it the easy way with a guide, but you might learn a thing or two about Morocco and the riding conditions. Also not needed, but some like to keep track of their location. Is ‘sahara-overland.com’ a registered tour company? No, it’s just the name of my website. The booking form includes a disclaimer that you’re undertaking this tour at your own risk. What guarantee do I have that you will not just run off with my money? None, but with my prominence on the web and in travel publishing this would be a short-sighted move. When will I know if the tour is confirmed? When there are at least four bookings. The booking status is here. If I have to cancel late in the day can I get my deposit back? Yes, as long as it’s before the balance has been paid. See the booking form for levels of refund once the balance has been paid. My question is not addressed here? All the info that I can think of is on these web pages which get updated from time to time. Please email me with other questions. I’m up for it. What do I do next?